Au Revoir, France! Macron’s Victory Is France’s Loss. Leftist presidential candidate, Emmanuel Macron (left) and Rightist presidential candidate, Marine Le Pen (right). The results are in: Emmanuel Macron has come out of the first round of the French Presidential Election as the presumptive favorite to win the presidency in the second round of voting on May 7th. Staunch Alternative-Right-wing candidate, the head of the National Front Party, Marine Le Pen, is his underdog opponent (at least according to the press). Indeed, a majority of analysts–on both the Left and the Right–assume that Le Pen has a ceiling of 40% of the French vote. Most believe that there is simply no way that Le Pen will come out victorious; the nationalistic-populist wave that allowed for Brexit and the election of Donald J. Trump will not turn in Le Pen’s favor. Although, keep in mind that the media was certain about the failure of Brexit and Donald Trump. “The poll, published Thursday for Les Echos and Radio Classique, showed Mrs Le Pen would garner 41 per cent of the vote in the runoff election on May 7 – a score up two percentage points in two days. But while Mr Macron, a 39-year-old political novice who has never before stood for elected office, is still widely expected to win the presidency, his second round campaign got off to a shaky start, with many saying that he has been acting as though his election victory is a “done deal”. As you know, I am much more optimistic of Le Pen’s chances. As such, I have given her a 60% chance of winning. 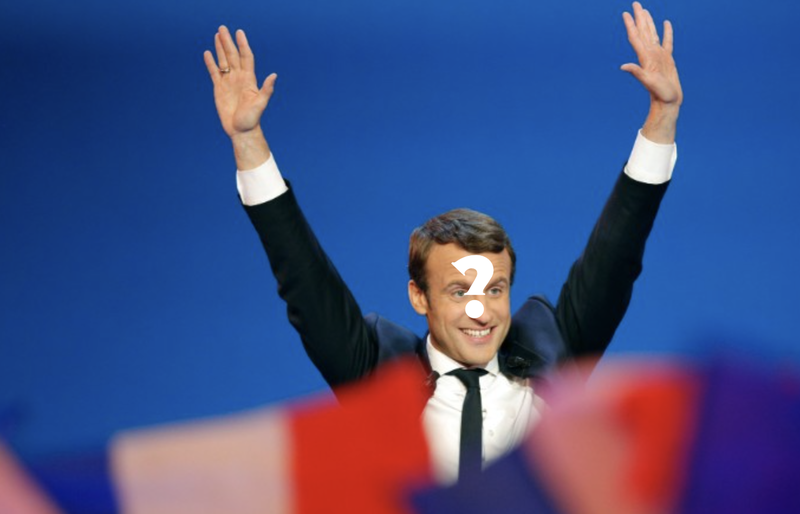 However, given the fact that no one is completely certain as to who will win in France, I would like to see what happens should Emmanuel Macron live up to expectations, and best Le Pen on May 7th. Suffice to say, it is nothing good for France. An interesting breakdown. The most populace parts of the country did overwhelmingly vote for Emmanuel Macron. The question is: how galvanized to return to the polls are the other voters who voted for neither Macron nor Le Pen? At its core, this election is a bellwether that most assume will determine the European Union’s future. Ever since Brexit, many have questioned whether the EU can sustain itself. If France were to elect Marine Le Pen, it would most assuredly seek to exit the EU. Should that happen (or so the conventional wisdom goes), the European Union would be one foot in the grave. So, the hope on the part of the Democratic-Globalists is that the French people will “see reason,” and elect Emmanuel Macron. Emmanuel Macron, like Hillary Clinton before him, and the “Bremain” crowd before that, seems a bit too comfortable in his polling. To be sure, the election of Marine Le Pen is not necessarily a boon for either the U.S. or the overall West. However, it might just be what France needs, in order to save itself from the precipitous decline it has suffered over the last 40 years. Although, I do worry that it might be too late for the France we used to know…no matter who wins this election. After all, the trends have been working against France’s favor for decades. What’s more, the one thing that could potentially resuscitate France–tax and regulatory reform, coupled with significant reductions in government spending–is the one thing that neither Macron nor Le Pen support. But, to say that Macron will solve all of the worries is ridiculous. His election, if anything, will exacerbate the problems both in France and throughout the West, as France continues limping on (and as many buy the false narrative that the globalist political order has been “saved”). Macron will be taking over a deeply divided (and corrupt) political structure. He will be assuming responsibility for a hopelessly ailing economy. The security situation will only worsen in France, as Macron continues to embrace the Political Correctness and self-loathing as a counterterrorism strategy. Oh, and immigration policy in France will continue to be defined by the open border policy that has gotten the country into its current predicament. Macron will not save the EU. It’s dying. Accept it. Of course, the larger question for foreign analysts, is how Macron’s victory would stabilize the slowly crumbling EU and, therefore, save the West from decline? He cannot. The EU has been slowly dying since the Great Recession of 2008 (though I will gladly hear arguments that the decline began much earlier than that). When the EU could not adequately address the economic woes of its members; when European leaders seemed unable to craft policies that would take growth rates beyond 1.2%, or lower unemployment below 8%, many Frenchmen no longer saw the benefit of remaining committed to the EU. The problem for the EU, then, is not instability. The instability the EU is suffering through is merely a symptom of the larger structural defects that comprise the political and economic structure of the Union. These defects go all of the way back to the founding document of the EU, the Treaty of Maastricht. The EU was envisioned as a supranational entity. While its predecessor, the European Coal and Steel Community, was a definitional free trade agreement, its successor body, the EU, was much more than that. It was a customs union with a massive external tariff. While it was a Free Traders’ fantasy for its members (there are effectively no borders between any of the European countries), there were high costs imposed on products coming from outside of the eurozone. The goal was to “buy European”, essentially. However, the EU never required its members to subordinate sovereignty to the supranational government in Brussels. It was all on an ad hoc basis, and it mostly pertained to economic policies. The EU government in Brussels acquired what many referred to as the “low-hanging fruits” of sovereignty. Basically, Brussels started doing things that national governments cared little to do. For two decades, they continued consuming as much of those low-hanging fruits of national sovereignty as possible. However, at some point, all of the low-hanging fruits had been picked; the national governments refused to give up the really important things. Foreign policy is the most prominent example of this. Aside from a handful of “peacekeeping” missions (mostly in Africa), there is no dedicated European foreign policy. What’s more, as evidenced by Brexit, if member states do not like how Brussels is treating them (or creating policies on their behalf that the members disagree with), the members can simply vote to leave. To compound matters for the Eurocrats, there is no singular European identity. There are merely national identities living very near each other (thus, Europe is much more like Asia as opposed to the United States). In fact, looking at France, one of the two prominent founding members of the EU, we see the prevalence of national identity superseding the supranational European idea. For instance, in 2005, the French had the opportunity to vote on an EU constitution. However, the French had become disenchanted with the EU for various reasons. One of the notable reasons was the fact that, since the EU favored economic power over any other form of power, the Germans had become the dominant force in the EU. This is in stark contrast to how the French envisioned their role in the EU playing out. Indeed, most French leaders assumed that the EU would become the means for a reduced France to effectively “punch above its weight” in foreign affairs. When that did not occur, the French were ambivalent about ceding greater degrees of their sovereignty to the supranational government. Ultimately, the EU constitution was passed in the form of the Rome Treaty in 2007. However, this treaty was nowhere near as binding as the Eurocrats believed (again, since Brexit invoked Article 50 of the treaty and pulled away from the EU with minimal pushback from the EU). Even if Macron, a Europhile, were to become the next French president, certain realities in France would remain unchanged. Or, more importantly, would continue to work against Macron’s favor. Namely, the demographic shifts contributing to the weakening of France overall and, specifically, the strengthening of the nationalistic-populist narrative. Courtesy of Bloomberg. Look at how Le Pen’s support has intensified since 2012. Should Macron win, I can assure you that these trends will not reverse. More importantly, since the EU is essentially driven by Germany, there can be little doubt that the EU will continue to limp on regardless of what happens in France. However, at some point, Germany will recognize that the EU is no longer a viable entity (at least as a customs union) and will seek to relegate the EU to history’s dustbin. So, while Macron’s election would certainly herald one, last-ditch effort to save the EU in its current form, it will ultimately prove fruitless. The ball is entirely in Germany’s court. European disunion will happen when Germany decides to let it happen. What we might be witnessing, as John C. Hulsman alluded to in 2003, is a growing ethnocultural divide between the Gaullic European continentals and the Atlanticist Anglo-Americans. If that were the case, one should expect a condominium of sorts between a Macron-led France and a globalist Germany, while much of the Anglosphere continues to be rocked by nationalistic-populist movements. If that were to occur, despite the claims that a Marine Le Pen victory would only benefit the Russians, a Germany-France condominium dedicated to Democratic-Globalism would undoubtedly benefit both the Russians and the Chinese. After all, the Germans are quite friendly of Russia and they favor increased trade with China. France is also committed to increasing ties with Russia and China. Whether it was the presidency of Jacques Chirac, Nikolas Sarkozy, or François Hollande, France had always maintained positive (and, until recently), increasing economic ties with Russia. Macron would be unlikely to stop these trends. In fact, his Europhilia would mean that he would make France increasingly beholden to neighboring Germany. As the divide between the Gaullic continentals and the Anglo-Americans increased, the German-France condominium would likely find refuge in a growing alliance with Moscow. Let us just first acknowledge that France, like many modern states, is only working for the highly educated denizens of the cities. For the rest of the French people, particularly those in old industries in the French countryside, they have been essentially forgotten. Macron is a creature of the French cities; he is a steadfast Eurocrat and his greatest support comes from the educated classes in France. Therefore, he will preserve the status quo in France. This means that opportunity in France will be negligible and growth will continue at an anemic pace. There’s something more also about French education: it is highly elitist. For all of the talk about the democratizing effects on education and equality that the EU system has had on its members, the French educational system is highly stratified. This has deleterious effects for the economy as well. The future of French students are often written by the age of 15. That is when the French begin testing their high schoolers and determining where their young people will go: will they go on to university, trade school, or some other job? While roughly 72% of all Frenchmen have high school diplomas, slightly less than 50% of the French go on to a traditional university (whereas undergraduate programs in the U.S. are usually four years, in Europe, they tend to be three years). If you are a teenager and your future is determined that early in life, how many people do you think will honestly have any idea of what they wanted out of their professional lives? Not many. In fact, this system denies people a chance at true success as they mature and figure out what they want to do with their lives. So, French higher education is highly selective and incredibly test oriented. What’s more, simply because a little less than 50% of French high school students move on to university, does not mean that the entire cohort in college graduate. In fact, for French public universities, there is a near 50% dropout rate, due to the high stress of testing rigors. This has had negative impacts on overall French economic output, since France is a part of the “Knowledge” economy. This post-industrial globalized system requires increasing levels of education to make someone even modestly successful. In France, if you do not have a university degree, the really good jobs will be denied to you. And, even more so than in the U.S., those with trade skills and non-university-type backgrounds feel the economic squeeze the hardest. Under this system, the middle-class is declining, as the requirements for even getting by are becoming so onerous, that there is a small group of educated “haves” being created and an even larger cohort of “have-nots” being relegated to having to survive on the government’s dole. Whereas education was viewed as liberating (which explains why so many support state-funded “free” college), in practice, it has become yet another way to create an economically divided society, with virtually no middle-class whatsoever. Courtesy of Edward Elgar Publishing. This is not sustainable. Fundamental changes need to be made. Such changes will never be made under a Macron presidency. After all, it is only the educated classes that are truly doing well in the current French economy (and even that is relatively unimpressive, judging from the high unemployment and low French growth rates). Macron is also an ardent supporter of France’s statist socio-economic policies. Thus, the expectation that he would ever be interested in either lowering the unemployment rate or increasing France’s growth rate is laughable. In all likelihood, Macron will add greater burdens onto France’s economy. And, so long as the economy continues at its anemic pace, the “threat” posed to the Democratic-Globalists will persist. In fact, the worse the economy does, the more dreadful the political instability will become in France. France’s demographic woes are the key to understanding what’s driving the politics in the country (and throughout the West). Increases in immigration have been allowed for two reasons: the native-born population has increasing number of aging people and too few young people to replace them. France is a Welfare state. That entitlement system is threatened by a lack of workers and a lack of economic opportunity. Things are so bad economically in France, that the joke among many Frenchmen is that the only way to make money in France today is to simply inherit it. Because as a greater share of the French population retires (at obscenely early ages) and goes on the public dole, there are not enough young people to replace them in the workplace and continue to provide funds for the entitlement system through taxes. So, France has happily increased the tax burden on those who do earn. Also, between the EU and the French government’s onerous regulations, entrepreneurial activity is depressed. To overcome the problem of lack of taxpayers and low levels of workers (compared to the Baby Boomers), the French have increased the number of immigrants. Of course, the immigrants are mostly coming from places in the Mideast, South Asia, and Africa. And, these immigrants tend to have radical politics, very different religious views, and they tend to have higher fertility rates than native-born French. They are also allowed to go on the public dole the moment they enter France as immigrants. This means that a severely constrained pool of taxes are now being further squeezed between the increasing levels of native-born dependence on entitlements and the increasing share of immigrants dependent on public funds. There are extreme, systemic problems in the French government. The solutions to these problems require radical rethinking at a national level. Does anyone seriously think that the virtual novice, the poster child for the status quo, Emmanuel Macron, really has any clue as to how to resolve the French economic woes? This is an especially important factor to consider. After all, the leading political issue in the West seems to be over how virtually unfettered immigration from foreign cultures is changing the makeup of Western states. Brexit happened because of immigration and economic concerns within the British middle-class. Similar trends propelled Donald Trump into the White House. Even if the majority of the French people decide to continue with the status quo, remaining committed to the EU’s open border policy will not only irrevocably change the French electorate, but it will also intensify the political instability in France. Macron has already indicated his support for increased levels of immigration into France. His victory will ensure that France is permanently changed. What’s more, his victory will ensure that France’s decline is managed rather than arrested. France’s demographic woes will continue unabated. In fact, they will increase. This will have extremely negative consequences for U.S. foreign policy over the long-run, as France’s Muslim population becomes an increasingly large, politically active (and well organized) subgroup in France. Of course, that does not inherently mean France will become a threat to the U.S. However, it has been proven that with an increase in immigration from the Muslim world into a country, there also is an influx in Islamic radical activities in that state. This is especially so when the host country has extremely lax immigration policies that are based upon Political Correctness rather than national security imperatives. As I have noted, the French political system is notoriously corrupt. For a Western European state, France is the most corrupt. Compared to the rest of Europe, according to Foreign Policy, France is one of the most corrupt political systems. This is because when the French system was created by Charles de Gaulle after the Second World War, he aggregated as much power in the office of the French president as possible. We often talk about the “imperial president” in modern American politics, but the French really take the cake in that regard. Furthermore, compared to the U.S., where we often lament the “Deep State” (that is, the intelligence community, diplomatic corps, and the lifelong bureaucrats) being a politically toxic cabal of statists, there is actually a French “Deep State.” The French civil servants hold much power in France and do have an agenda. What’s more, the French intelligence services are very powerful–and exist in the shadows in a way that no American intelligence service ever could. There is an old saying among intelligence professionals that if you want to get something done with the French, you never go through their political channels. You simply go to their intelligence services. The French “Deep State”, then, has much power. Macron will not overturn this paradigm. And, while I have no opinion on the matter of a French shadow government, as The Weichert Report‘s nationalistic-populist matrix indicates, if there is an overriding perception of elite corruption, there will continue to be political instability in a state. This is key. Because the same people in the old middle-class in France who believe that they’ve been left behind by the Democratic-Globalist consensus in France, are the same people who are more keen to being aggravated with any form of political corruption. This is a point that is related to the fact that Macron will continue with France’s open door immigration policy. Right now, Paris has “no-go” zones where Muslim immigrants have effectively balkanized themselves from the rest of Paris. Similar conditions exist in a handful of southern French cities as well. It is from these places that many of the terrorist attacks in recent years have emanated from. These divisive trends are being exacerbated by ceaseless immigration and an unwillingness to force those mostly Muslim populations to integrate into the larger French body politic. At the same time, as the share of immigrants increase in France, their voting patterns reflect their unique cultural proclivities. Thus, arguments over whether Sharia law should be permissible in French society come about. A desire arises to try to use French laws protecting threatened minorities as a cudgel to silence and intimidate those “who insult Islam.” These movements began on the fringes of French society, but now that the share of Muslim immigrants is increasing, these movements are beginning to become mainstream. French Muslim “morality police”, of the sort who routinely terrorize women in Saudi Arabia, have been attacking French women who deign to walk through “their” sections of Paris without conforming to the traditional Islamic dress code for women. As this continues, Macron has made clear his intention to ignore the threat that Islamism poses to France. Given the declining native-born population size, the lack of economic opportunity in France, and the explosive growth of the Muslim population in France, it is only a matter of time before the French political system is irrevocably changed. Thus, fears of an impending “Eurabia“ go from being a Right-wing fantasy, to a brutal reality in no time. We’re already seeing the ramifications of this play out in France. Many French Jews are removing themselves entirely from the country, as antisemitic sentiment increases. Antisemitism is on the rise, mostly because of the increase in radical Islamic thought. However, it should be noted that there are also raging antisemites on the far Right in France. And, to be fair, the recent rise of the Le Pen movement has allowed for otherwise marginalized antisemitic figures to come out into the open of French society. Since the devastating Paris terror attacks last year, Paris has been under martial law. Heavily armed French soldiers line the streets, French constitutional protections have been suspended or overridden in the name of national security, which has caused a backlash from both the growing Muslim minority in France, as well as the French people. Besides, creating a police state to protect democracy is a wholly inefficient use of resources. However, given the stifling restrictions imposed upon the French government between the EU immigration policies and the Politically Correct “multicultural” policies when it comes to actually integrating Muslim immigrants into French society, there is virtually no other way to protect the French people from terrorism. A new paradigm is needed in French counterterrorism and immigration policy. Again, Macron will do almost nothing to change this reality in France. His refusal to fundamentally reform France’s immigration programs and his inability to recognize the threat that Islamism poses to France means that the French people will continue suffering through terrorism. It also means that the French people will have effectively lost their democracy. Why must innocent French citizens be effectively punished for the repellent actions of some radicals living among them? French soldiers deployed to Paris. And, by the way, the increase in insecurity will only negatively impact the French economy further. So, these trends have a pernicious way of feeding each other, amplifying the negative impact of one trend as they build off of each other, in some horrific negative feedback loop. History has most definitely returned to Europe. No one has been protected from these shocks on the continent. The sclerotic EU has been on the wrong side of the issues most harming Europeans. Indeed, France’s commitment to the EU’s policies over the last two decades has essentially neutered the French people’s ability to overcome the challenges that the entire continent now faces. Radical change is needed in a last ditch effort to save France for the French. Even Macron’s supporters are lukewarm on the Macron candidacy. Those supporting him are merely opposed to Marine Le Pen and her nationalistic-populism. This is why I have remain committed to my previous claims that Marine Le Pen has a 60% chance of winning the French presidency. French polling has been notoriously accurate. French voter turnout was at an all-time high in the first round of the election. The French seem incapable of abandoning their overall commitment to Social Democracy and the globalist promises of the EU. There is a different ethnocultural historical narrative in the Gaullic countries compared to those derived from the Anglo-Saxon world. Yet, Macron and his supporters should hardly feel confident. But, I remain dubious of the uniform confidence that the same experts who’ve gotten Brexit and Donald Trump wrong, seem to hold on Macron’s chances. And, we mustn’t overlook the general nationalistic-populist trend that is devouring Western politics presently. This is a very telling quote, seeing as Marine Le Pen will benefit from a large number of abstentions from people who voted for candidates other than herself or Emmanuel Macron in the first round of the election. So, while turnout may have been higher than in previous elections for the first round, it remains to be seen whether or not turnout will remain at similar levels, now that many people’s preferred candidates have been defeated. Even if Macron does manage to eek out victory on May 7th, does anyone really believe that Marine Le Pen will simply go away? Given her increase in the share of French voters who supported her this election compared to those who supported Le Pen in her previous presidential bid, she is likely to return for another election cycle in 2022. Emmanuel Macron will fix nothing. It will simply be another missed opportunity for the French to arrest their decline. His election will only exacerbate the damage that will ultimately be done when the European Union finally buckles under its own weight. Whether the EU collapses fully or becomes a sub-regional trading bloc is irrelevant. The point is, the supranational customs union will have been lost. Whatever comes next will be a German-dominated zone with Gaullic continental overtones. Under such conditions, the pull of Russia and the threat of long-term Islamic radicalization of France will be utterly destabilizing. So, my friends, a vote for Macron will likely be a vote to ensure the France we’ve always known dies. Whatever replaces it will not be good for U.S. foreign policy. And, as for Marine Le Pen, her presidency would likely leave much to be desired. But, at least she might be able to do some good for the French people. And, hopefully, she will realize the dangers of aligning with Russia, and seek to remain in America’s “Atlanticist” camp. In either event, there are no “good guys” in this election; just varying degrees of bad to destructive. The next week is going to be very interesting to watch. France is truly in distress.